Okay folks - here we go! Our first 'long distance' hockey trip in quite a while, and a pilgramage to hockey's hotbed - QUEBEC! 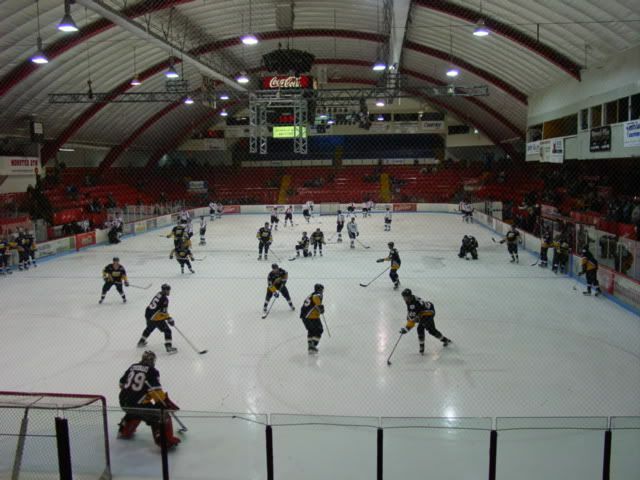 The main point of this trip was to watch a couple of games in the "Ligue Nord Americaine de Hockey". We had watched a documentary about the Chiefs de Laval who played in the LNAH, a senior circuit league based in the Province of Quebec. Finding a couple of days to ourselves, as well as an extra day off for me, we decided to make a trek north to watch some hockey. 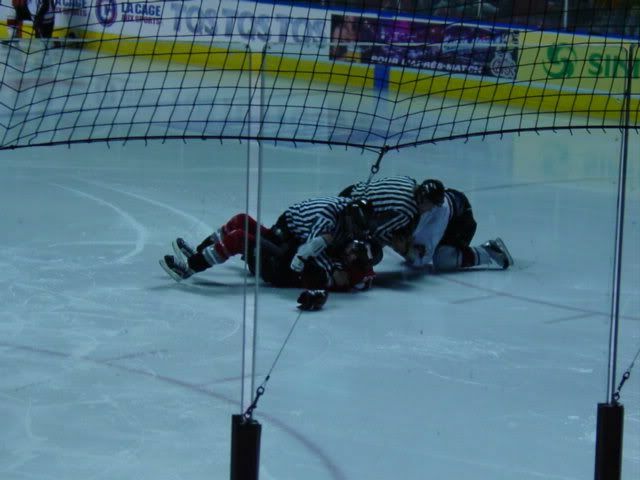 This wasn't just any hockey either - think of the movie "Slapshot", and if you can imagine that, then you know what the hockey in the LNAH was a lot like (less Ned Braden stripping thank goodness!). We headed out on Wednesday night, traveling up Interstate 88 towards Plattsburgh, which was where we were going to stay the first night. Of course, as I've written before on here, no trip up I-88 is complete without a stop at Brooks' BBQ in Oneonta - so we stopped there for dinner. Afterwards, we completed the full stretch of I-88 and picked up I-87, the northway, to complete the drive to Plattsburgh. We started out around 5:30 from Binghamton, and pulled into Plattsburgh at about 11:00. We hit a lot of snow, both from the sky and blowing across the road, after we got up into the Adirondacks. We stayed at the Days Inn Plattsburgh, and although we usually avoid hotels in this chain it was a nice enough room and fit the bill - which was a few hours sleep before the next leg of the trip! Bright and early on Thursday morning, we hopped back into the car and headed to Canada, crossing the border at the top of I-87. As we crossed the border, as usual, the border guard asked us where we were going and why. When we told him to Quebec City for an LNAH game he said, with a very good accent, "Oh, you like that kind of hockey". No problems at the border when you come into the country to watch a hockey game! 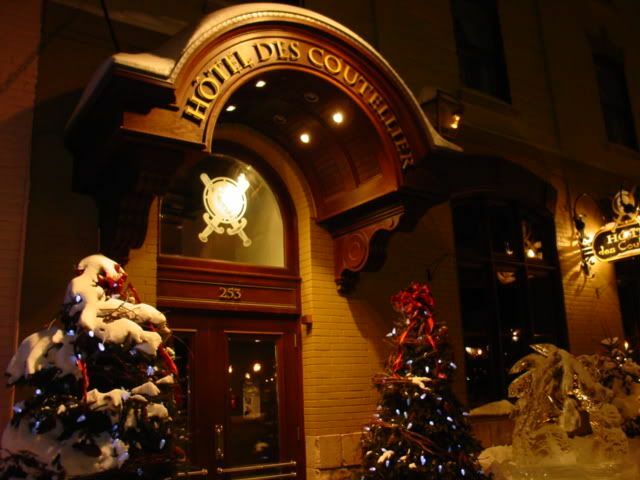 Arriving in Quebec City, we found our hotel - Hotel des Coutellier, at 253 rue St Paul - a small boutique type hotel situated just below the ramparts of the old city. After getting situated in the room, and bundling up a bit, we headed up, and I mean UP, into the old city. We walked quite a ways along rue St Jean, until we found J.A. Moisan, located at 699 rue Saint-Jean, which is the oldest grocery store in North America. The store was ripe with narrow aisles and turns, with a unique collection of foodstuffs. Very different from the Wegmans and Price Chopper that we are used to, this was the way it used to be 'back in the old days'. 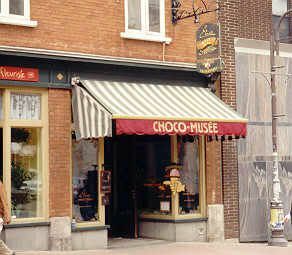 We headed back down rue Saint-Jean, and stopped at the 'Choco-Musee', a small store front with a chocolate museum in the back. Many yummy treats in there, and the placed smelled awesome with all of the chocolate wafting through the air! Lunch was at La Piazetta, 707 rue Saint-Jean. After warming up a bit in there, we stopped at another store on rue Saint-Jean called "Kama Sutra". (Think of the name of the store....then think this is Quebec City - need I say anymore?) We stopped at a patisserie around the corner to grab a yummy dessert, and then headed back inside of the old city and up to an area where they were setting up for Carnival - an entire castle made out of ice bricks! Very cool (pun intended) to see. Then we found ourselves at the base of the Hotel Frontenac, the quintessential view that everyone sees of Quebec City. At this point, we were cold (very cold), so it was back to the hotel to warm up before heading to the game. The drive to Colisee' Pepsi took only about ten minutes or so - good placement of the hotel that we chose in relation to where the rink was! 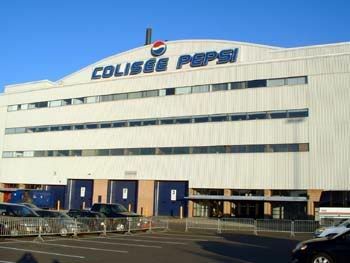 The Colisee' Pepsi was the old home of the Quebec Nordiques prior to their move to Colorado, and I'm sure in a way it's reminiscent of the older NHL rinks across Canada. All of the seats were wooden in the arena, the lower bowl being red, middle portion being blue, and the upper deck white. The pitch of the upper deck was such that they actually had bars that ran the length of every row - probably so the people didn't fall out of their seat on top of the person in front of them! 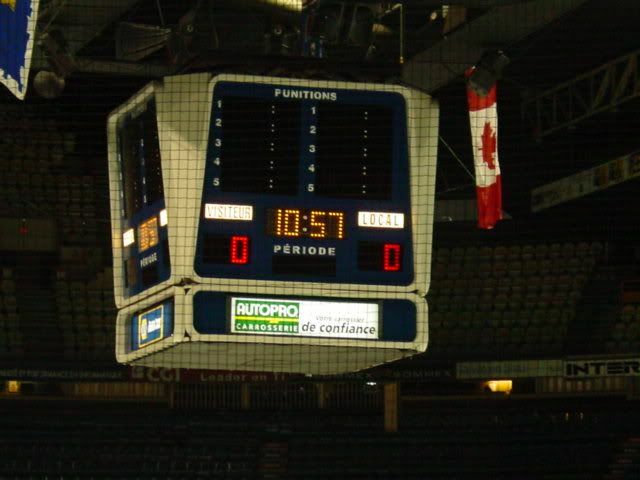 The scoreboard was very basic - just the facts - no flashy video replay boards or anything like that. This place breathed hockey at its purest form. You could tell that these people went to the rink for one reason, and one reason only - to watch hockey. That was further evidenced by something we observed in both Quebec City and Laval - there wasn't much, if any, movement during the game from the fans. When the horn sounded to end the period, pretty much everyone in the place got up to use the facilities and get something to eat and drink, and then at the start of the next period everyone was in their seat ready to go. When the first fight of the game occured less than a minute in, we knew that we were in for quite a show! The two teams played a really good hockey game, and the skill level was on par with what we are used to seeing in the AHL. There were quite a few players that we recognized also from their 'professional' playing days. Eric Fichaud played in goal for Radio X, and Martin Brochu was the Verdun goalie. Sylvain Blouin, who played for the Binghamton Rangers early in his career, was on the Radio X roster as well. After Radio X scored their first goal, a familiar 'theme' song echoed through the arena - none other than 'Brass Bonanaza', the old Hartford (and Binghamton) Whalers theme song was played each time Radio X scored. So, of course, we wanted them to ring up a bunch of goals! In all, there were 10 fights during the game, and Radio X won 5-2, scoring 4 of their 5 goals in the third period. 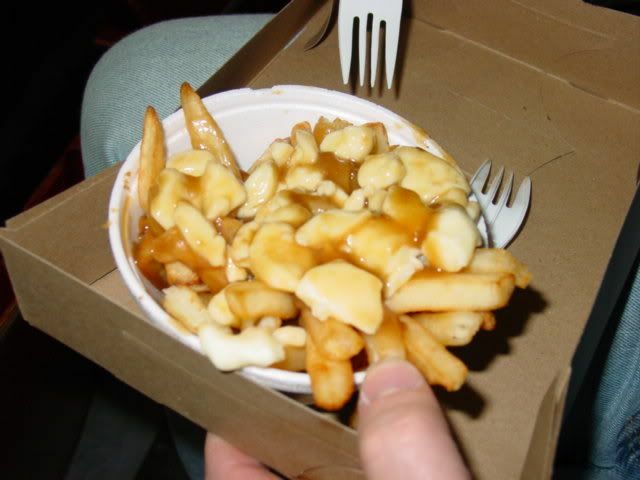 For dinner at the game, we had our first (but definately not last) taste of 'poutine', a mostly Quebec cuisine. Poutine is french fries, covered with cheese curd, and hot brown gravy poured over all of it! Pretty awesome tasting! We got up on Friday morning, and found a basket outside of our door hanging on a hook. Inside, there was breakfast and the days weather report! 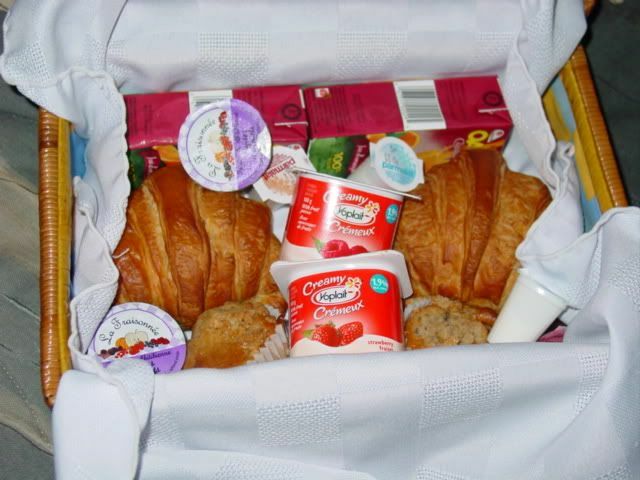 Breakfast consisted of orange juice, a croissant, a small muffin, and some really good yogurt! Couple that with the coffee in the room, and we were full and ready to start our drive to Laval! 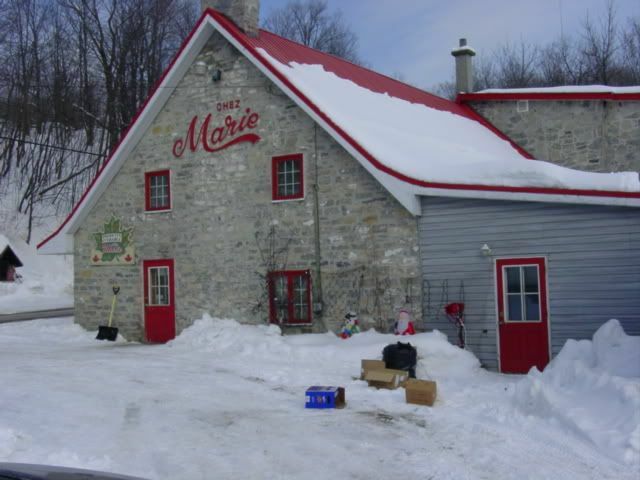 Before heading south, however, we went a bit north to Chez' Marie. Jill and I had seen a show on the Food Network that highlighted this roadside eatery. Their main claim to fame? Bread! The bread oven is situated beside the store in the parking lot, and in the milder months they cooked bread in there pretty regularly. With it being so cold at this time of the year, they aren't able to cook outside, but the store was still open. We came home with a couple of jars of maple butter (awesome stuff!) and a loaf of bread. 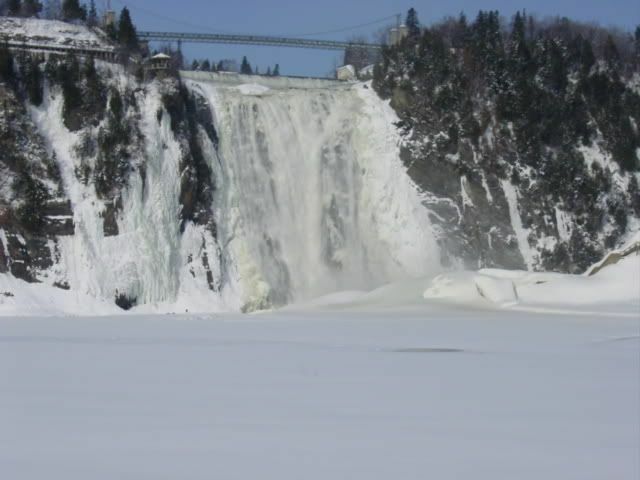 As we headed back south again, we stopped quick at the 'Chute Montmorency' (Montmorency Falls). It was FREEZING when we got out of the car, so it was a quick 'yep, there's the falls', snap a couple of pictures, and then back into the car again!! 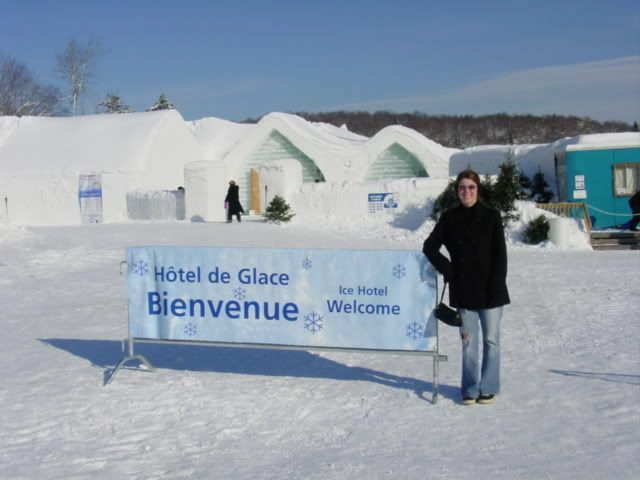 On the road to Laval, we came upon a roadsign that showed the Ice Hotel at the next exit. 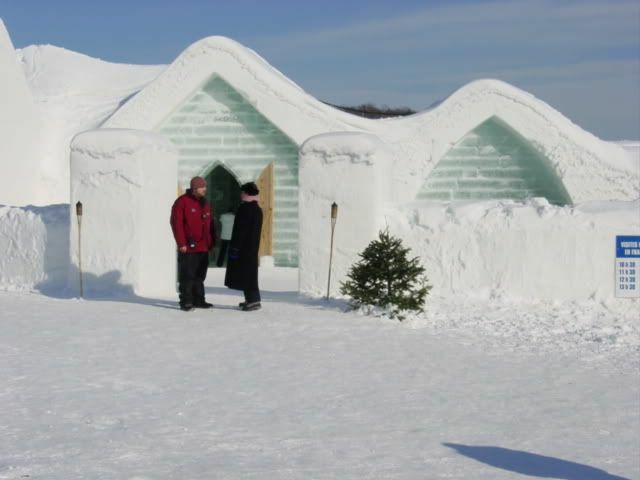 Having seen one or two documentaries on TV about it, we decided to take a quick detour to see what the Ice Hotel was all about. However, considering it was as cold there as it had been at the falls, and the fact it would have been $14.00 a piece to go through it, we took a few pictures outside and bought a couple of souvenirs. Our last stop was in Trois-Riviers for lunch. We found a 'Mikes' restaurant and decided this was our best and easiest option for lunch. Being that we were still deep inside of Quebec though, communication with the waitress was a bit spotty at best. Plus, and this is something Jill noticed after we were there for a little bit, we were the only people in the restaurant that were actually eating. The place was probably 2/3 full, and everyone else was just drinking coffee or tea, smoking, and talking. Apparently, 'tea time' is still something adhered to in 'ol Quebec. Made our way to Laval, and didn't have any trouble finding the next hotel since it was right off of the exit. For this part of the trip, we stayed at Le St-Martin Hotel and Suites at 1400 Maurice Gauvin St in Laval. A very nice hotel, with modern looking rooms and a VERY comfortable bed! Jill did awesome at selecting hotels for this trip! From the hotel to the Colisee' de Laval it was pretty much a straight shot, with a couple of turns towards the end that put us right into the parking lot. 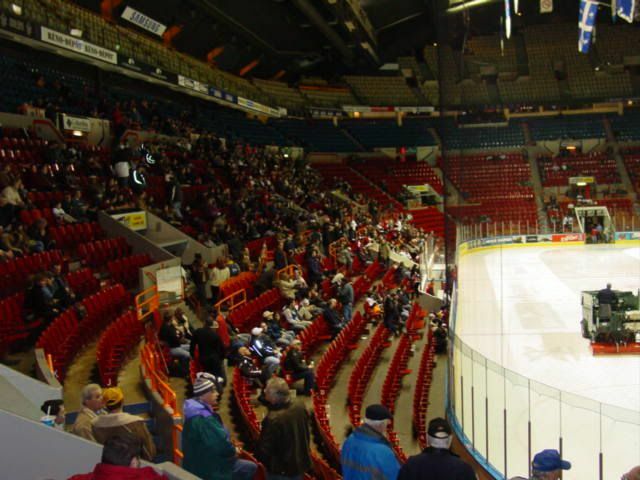 The fans here were considerable more subdued than those in Quebec City. That may have had a lot to do, however, with the fact that the on ice product, namely the Chiefs, are in last place. The game was kind of harsh to watch, and it was obvious that we were seeing two teams at the other end of the LNAH spectrum. Matthieu Chouinard, who spent a bit of time playing with the Binghamton Senators, started in goal for the Chiefs - and CRS shelled him. He was finally chased from the goal after allowing 7 goals. It was pretty much a lame game, with a lot fewer fights than we had expected, or that we had seen the night before. At one point towards the end of the third period, two players squared off at center ice - the Chiefs player a head shorter than the CRS player. They danced around with their fists in the air for a couple of minutes, trying to jockey for position. 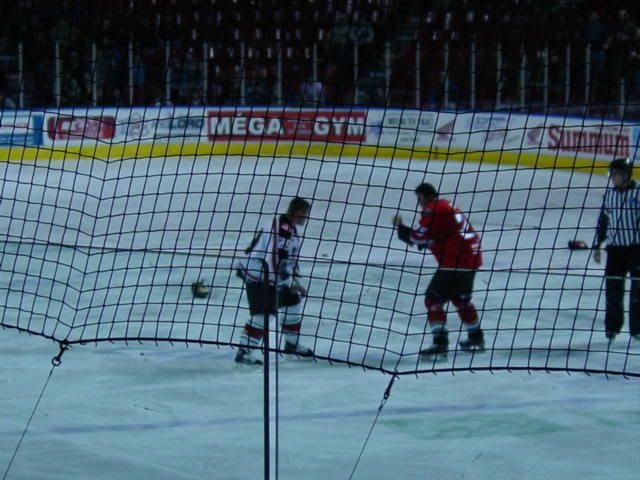 Finally, the CRS player got frustrated, waved his hands in disgust at the Chiefs player, and skated off the ice. It was a pretty pathetic display, but considering the score was something like 9-7 at that point, it just added to a laughable game. After the game, we found a Boston Pizza near the hotel and stopped to have some dinner. Next morning, we had breakfast at the hotel and then headed out. We stopped at an SAQ and bought a couple of bottles of Caribou to bring home with us, and also stopped at a bakery and bought a nice loaf of bread to bring home for Jill's mom. The drive home was pretty uneventful. We crossed the border at Rte 81 just above Watertown. Lunch was at Doug's Fish Fry in Cortland - we had stopped at the Dino in Syracuse, but the wait was to long. When we got to Binghamton, we went straight to the Arena since Michael had a house league game - made it just in time for the start of the game! Three games in three days in two different countries - not bad, eh? Le Radio X s'en promettait avec la visite des Dragons de Verdun-Montr�al ce jeudi au Colis�e Pepsi. Les � X � ont mis les pendules � l'heure devant des Dragons qui ont tout de m�me fait face � la musique. Une victoire de 5-2 pour Qu�bec, mais un pointage qui n'indique pas l'allure de la rencontre. Fr�d�ric Bouchard a cr�� l'�galit� 2-2 � la 13e minute de la troisi�me, puis Simon Tremblay a enfil� le but vainqueur avec trois minutes � �couler � l'engagement. La troupe d'Alain Rajotte signe une cinqui�me victoire cons�cutive, une 30e cette saison. Un match robuste, grandement appr�ci� par les 4000 spectateurs, dans lequel 10 combats ont �clat�, et qui met la table pour le prochain affrontement entre les deux formations, le 7 f�vrier � Verdun. Les hommes forts savaient � l'avance qu'ils allaient avoir une grosse soir�e en perspective et Jason Payne a tout d'abord contribu� en donnant l'avance au Radio X en milieu de premi�re p�riode. Les visiteurs sont revenus � la charge en deuxi�me avec 19 lancers sur �ric Fichaud, dont deux ont trouv� le fond du filet. Dominic Chiasson a tout d'abord inscrit son 35e de la saison, un sommet dans le circuit, � 9 :46, avant de voir Dominic Beaudin donner les commandes au Dragons � 15 :04. Martin Brochu a continu� � repousser les assauts du Radio X durant une bonne partie de la troisi�me, mais devant un bombardement de 26 tirs dans les 20 derni�res minutes, le gardien des Dragons n'a pu faire autrement que de s'avouer vaincu. Fr�d�ric Bouchard a tout d'abord cr�� l'�galit� � 12 :57 puis un autre d�fenseur, Simon Tremblay, a profit� d'un jeu de puissance pour redonner l'avance aux X � 17 :00. Marco Charpentier a repris ses cinq points d'avance sur Chiasson en t�te des marqueurs du circuit en faisant bouger les cordages � 17 :23, puis Sylvain Blouin a ferm� les livres avec son 10e de la saison � 18 :33. Qu�bec n'a profit� que d'un seul de ses neuf jeux de puissance, mais Verdun-Montr�al a fait encore pire, en �tant blanchi sept fois en pareilles circonstances. Le Radio X a domin� 55-37 au chapitre des lancers. R�mi Royer, du Radio X, a jet� les gants contre Corey Laniuk, Jacques Dub� s'est mesur� � Steve Boss� et � Ryan Pisiak, Mike Brault � Pisiak et � Gerald Moriarity, Bryan Lachance � Laniuk, Jimmy Grondin � Ryan Braun � deux reprises, et Jason Payne � Moriarity et � Boss�. � Je dois donner le cr�dit aux Dragons. Ils ont commenc� quelque chose lors de notre dernier match � Verdun et ils ont continu� le tout ici ce soir. Ils se sont � pr�sent�s � et ils ont fait face � la musique. Je ne l'aime toujours pas plus (en parlant de son vis-�-vis Pierre Pelletier), mais je respecte ce que lui et son �quipe ont fait ce soir. J'ai n'ai toutefois pas aim� les agressions sur Royer et Roy. Mes joueurs vont toujours s'attaquer seulement aux toughs de l'autre �quipe, mais Pelletier ne semble pas comprendre ce principe. 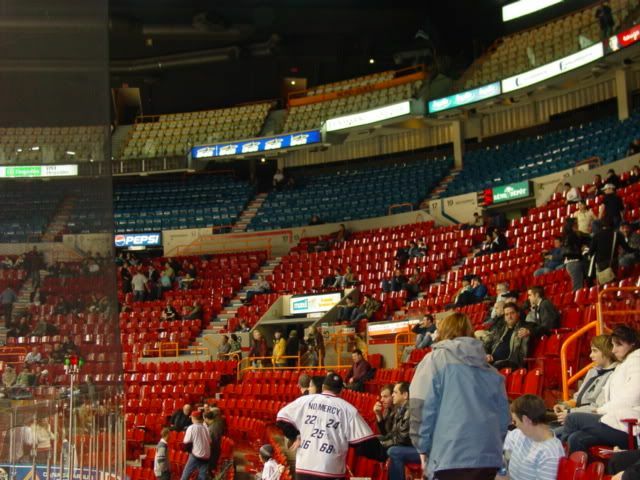 Tous les ingr�dients �taient l� ce soir pour un bon match de la LNAH �, a r�sum� l'entra�neur du Radio X, Alain Rajotte. Laval, Claude Morin a amass� deux buts et trois aides pour aider le CRS Express de Saint-Georges � disposer des Summum-Chiefs par le pointage astronomique de 9-7. Les Beaucerons signent une troisi�me victoire de suite, une cinqui�me � leurs six derni�res rencontres. Avec cette 15e victoire cette saison, le CRS, class� sixi�me, a maintenant sept points d'avance sur le dernier rang. Les Chiefs, quant � eux, n'ont pas gagn� � leur huit derniers matchs, soit depuis le 30 d�cembre, alors qu'ils avaient vaincu les Dragons de Verdun-Montr�al 6-3. Laval, neuvi�me, n'est qu'� deux points du huiti�me rang et du Cristal de Saint-Hyacinthe, tout en ayant deux matchs en main. Le match marquait les d�buts du gardien Claude Fernet dans l'uniforme du CRS Express, lui qui a �t� obtenu la semaine derni�re dans une transaction avec Qu�bec. Les Summum-Chiefs avaient eux aussi un nouveau gardien devant leur but en Mathieu Chouinard, qui donnait ses premiers coups de patins dans la LNAH. Chouinard a �t� le premier � c�der lorsque Claude Morin a profit� d'un jeu de puissance apr�s 4 :59 de jeu. Les Summum-Chiefs b�n�ficiaient � leur tour d'un joueur en plus lorsque Patrick C�t� a inscrit son premier de la saison pour niveler la marque � 7 :37. Face � son ancienne �quipe, Chris Cloutier a remis les visiteurs aux commandes � 8 :47 avec son premier but dans la LNAH, lui qui disputait un 42e match dans le circuit. Kevin Cloutier a ensuite creus� l'�cart � deux buts en inf�riorit� num�rique � 13 :08. Le CRS a profit� de la deuxi�me pour prendre les devants 7-3. Denis Chalifoux a tout d'abord inscrit le second des Summum-Chiefs � 5 :55, mais Saint-Georges a ripost� avec quatre filets, marqu�s par Steve Gosselin (6 :47), Olivier Maltais (a.n 9 :03), Claude Morin, son second du match, (a.n. 14 :08) et Jonathan Delisle (14 :22). Le but de Delisle devait d'ailleurs amener le remplacement de Mathieu Chouinard par Dave Stathos. S�n�que Hyacinthe a donn� la parole aux Lavallois avec son 10e de la campagne � 18 :04. Les d�fenseurs Steve Gosselin et Chris Cloutier ont compt� chacun leur second de la soir�e � respectivement 4 :07 et 4 :20 de la troisi�me pour porter la marque � 9-3. Il y aurait pu y avoir encore plus de d�g�ts si Jimmy Verdule (5 :52) et Gabe Yeung (6 :52), qui r�ussissait son premier filet dans la LNAH, n'avaient pas compt� en d�savantage num�rique pour les Summum-Chiefs. 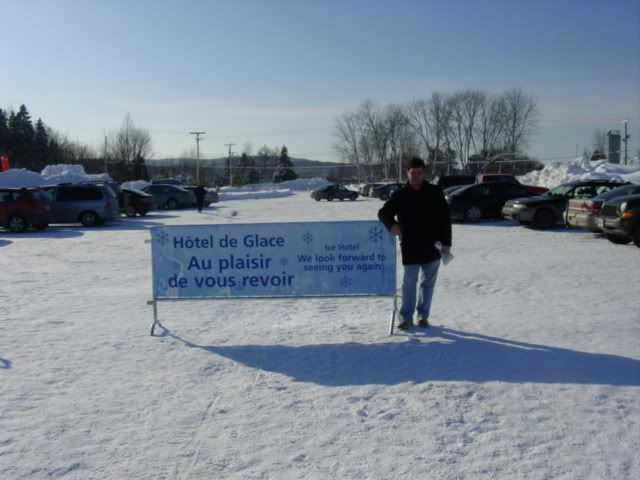 Daniel Goneau et Carl M�nard ont compl�t� la marque. Jonathan Delisle (1b-3a) termine le match avec quatre points et Olivier Maltais (1b-2a) avec trois. Du c�t� de Laval, Jimmy Verdule (1b-3a) et Jonathan St-Louis (4a) en ont aussi quatre, et Denis Chalifoux (1b-2a) trois. Des joueurs du CRS ont atteint des plateaux importants, Kevin Cloutier a r�colt� son 60e point de la saison, Claude Morin a pass� le cap des 50, il en a maintenant 52, et Philippe Audet a lui aussi atteint le chiffre de 50. Les deux formations ont b�n�fici� de cinq jeux de puissance, Saint-Georges en a profit� trois fois et Laval � une seule reprise. Claude Fernet a fait face � 45 tirs. Le CRS a obtenu 39 lancers au total, dont 27 sur Mathieu Chouinard qui a allou� sept buts en 34 minutes avant de c�der sa place � Dave Stathos. Jonathan Delisle, du CRS Express, s'est battu avec Leon Delorme, Brandon Christian s'est mesur� � Dion Hyman et � Kurtis Swanson alors que Chris Cloutier a affront� ce m�me Swanson.